If you are in search of extended stay hotels in Brooklyn NY, whether on a business assignment or between residences, consider the Condor Hotel. Contact the staff to inquire about extended stay hotel options and discounted rates for stays of 30 consecutive days or longer. Also, we are able to waive certain New York state and city taxes in accordance with New York’s 3 and 6 month hotel stay tax policy. Our location is convenient to a supermarket and laundromat, and unlike other hotels, long-term guests at The Condor are provided the same amenities as short-term guests, including daily housekeeping. 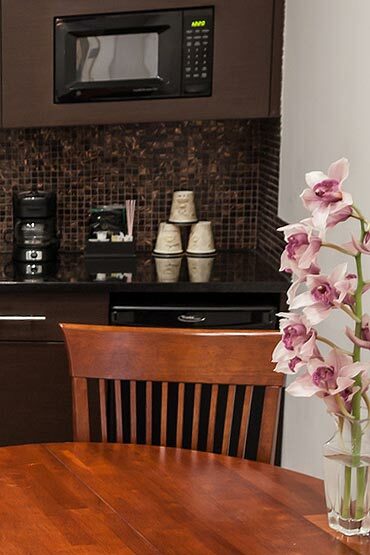 While all of our comfortably appointed rooms come with a kitchenette and many other amenities not found at other Brooklyn boutique hotels, our larger suites also include a large dining area, parlor area, and a private terrace. Plenty of space to stretch out, relax, and make yourself right at home in the Condor atmosphere.